Cut the drive chain. 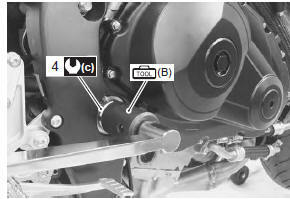 Refer to “drive chain replacement” in section 3a . 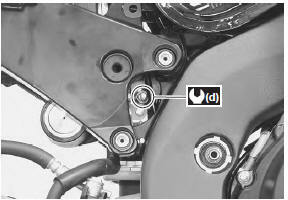 Disconnect the rear brake hose from the brake hose clamp (1). Remove the brake hose clamp bolt (2). 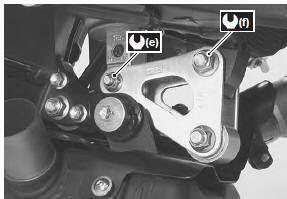 Remove the rear brake caliper from the swingarm. 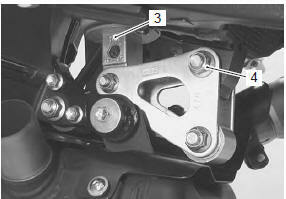 Remove the rear shock absorber (3) and cushion lever mounting bolt and nut (4). Refer to “rear shock absorber removal and installation” and “cushion lever removal and installation” . 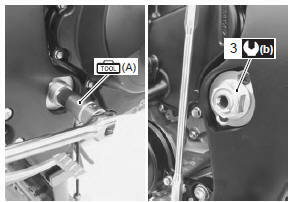 Remove the swingarm pivot shaft lock-nut with the special tool. 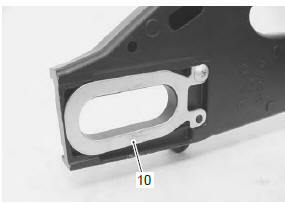 Hold the swingarm pivot shaft (5) with the special tool and remove the swingarm pivot nut (6). Remove the swingarm pivot shaft. 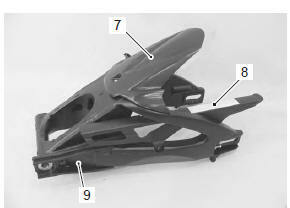 Remove the mudguard (7), chain case (8) and chain buffer (9) from the swingarm. 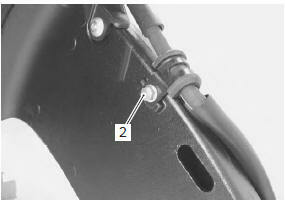 when reusing the removed screw (1), apply a small quantity of the thread lock to it. 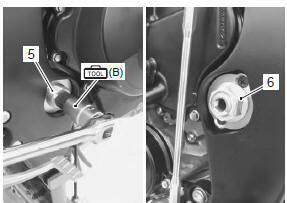 – insert the swingarm pivot shaft (2) and tighten it to the specified torque with the special tool. 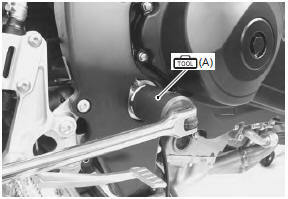 – Hold the swingarm pivot shaft with the special tool and tighten the swingarm pivot nut (3) to the specified torque. 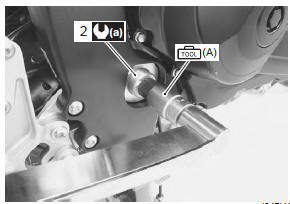 – Tighten the swingarm pivot lock-nut (4) to the specified torque with the special tool. Tighten the cushion lever, cushion rod and rear shock absorber mounting bolts and nuts to the specified torque.